Most men will suffer from genetic hair loss, here at the Shadi Danin Medi-Spa we can help you to stop and reverse the hair loss. Hair loss (androgenetic alopecia) can occur for many different reasons and is more common in men. Identifying the most effective hair loss treatments can be an extremely difficult task. Shadi Danin is an experienced trichologist who can establish the cause of your hair loss, and then provide a tailored treatment it to reverse the process. No matter what your age or stage of your hair loss, our area of specialism is the treatment of hair loss here at the Shadi Danin Medi-Spa. We have a wealth of expertise in hair loss and approach each case with sensitivity and care. Using the latest laser technology, sometimes in combination with other treatments, we effectively treat hair loss and scalp disorders with amazing results. Most common hair loss is called male pattern baldness, most men start going bald in their early twenties and can take typically 15 to 20 years to go bald, nearly half of men in their 50s are quite bald, however some could go bald in 5 years or less. Full costing for the products and laser treatments are explained at your consultation visit and the patient is under no obligation to make any decisions at that time. We always encourage people to consider the information before embarking on any course of treatment, although it is usually possible to start treatment at the same visit is so desired by the patient. There is a £120 consultation fee which is refunded if you go ahead with the treatment. PRP (Platelet Rich Plasma) we take a small amount of blood and treated in a centrifuge so that only PRP remains and inject into your scalp. Mesotherapy treatment is use for prevention of hair loss, hair regrowth and scalp care. The procedure uses a MESO injected gun. 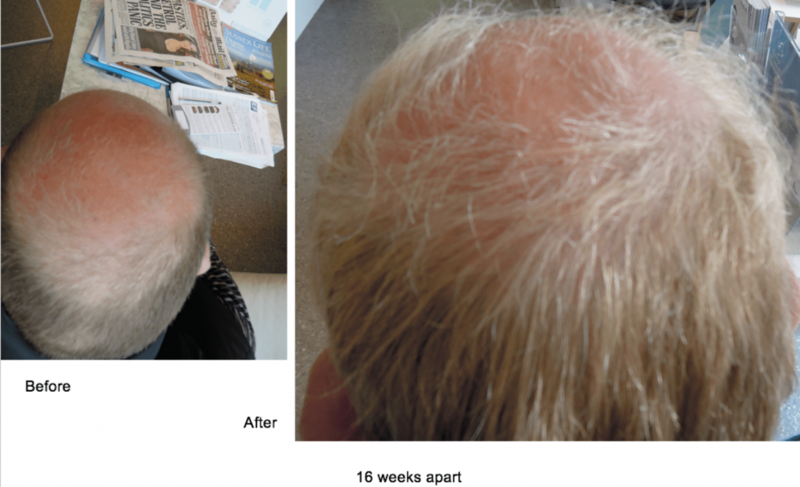 Laser Hair Therapy – A completely painless laser in which over 95% of patients experience re-growth and upto 50% increase in blood flow to their scalp. 100% of women had stablisation of hair loss and stops further hair loss almost immediately as well as an increased in thickness of the thin hair. 13 minutes treatment. Hair loss products. HLCC, Esterell (Zumnio), La Biosthetique. Immediately after your treatment there will be little or nothing to see on the treated hair, however some people do see little bumps on the injection site which has been known to happen. Patients may experience a temporary soreness that will subside within a day or two. Massage the area for 7 days following the treatment for at least 15 minutes.